Mole's can be found all around Milwaukie and are most active during Spring and Summer month's in Oregon. We are able to setup a trapping program for any problem and stop the damage. It is important to make sure get your problem taken care of right when you notice you have damage because it can grow rapidly. We have been solving mole problems for years and have a very high success rate and our customer satisfaction is our number one priority. Mole's can also do large amounts of damage to farm fields or large commercial land. We are equipped to handle any size job and enjoy doing the work for you. If you have moles then you know how frustrating it can be to try and solve the problem yourself. We want to relieve that stress for you and save your yard or property. Moles Gophers Voles I have no idea!! Gopher's are often confused with moles because they are both nuisance critters that tunnel and can destroy your yard. The gopher's that we have in Oregon are some of the largest in the United states, this is because we have such perfect land for them to survive. This also bring a large population and that creates alot of damage done by these to people are around the state. We can solve gopher problem's and because they are so large it takes specific traps to get the job done. Many times people with have moles and gophers in there yard at the same time. Vole damage can be very shocking to people because most have never heard of a vole. They are small animals that look very similar to a mouse, but have a shorter tail. You can see in the picture what vole holes and damage looks like. The holes are usually around the size of the golf ball or smaller and you can see obvious trails worn into the grass. 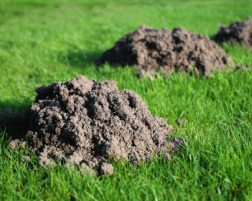 The best way to take care of these problems are similar to gophers or moles and that is to trap them. They can reproduce very quickly and spread the damage around rapidly. 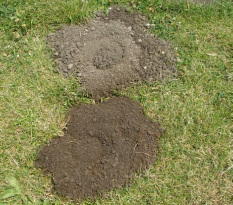 For Mole, Gopher, and Vole Control Call 503-201-2432 Today!